Achieve semi-permanent hair removal with laser hair removal. The only hair removal method that is FDA approved as "Permanent"
We Buy and Test Hair Removal Products for You! that we've recently bought and reviewed on Hair Free Life.. Thank You. This was really helpful to me choosing what one to go for. Your Hair Removal Questions Answered! 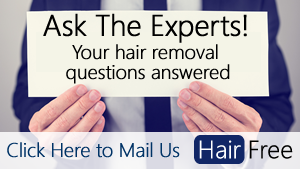 Ask our experts any question about hair removal and we will get back to you with an answer within 24 hours! Who are We and What is This Site About? We're the only hair dedicated hair removal site on the net. Learn more about our hair removal experts.